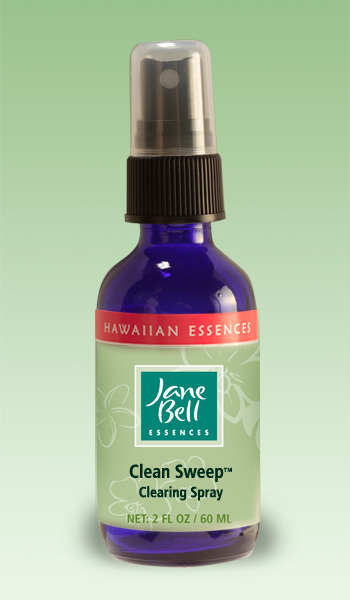 Our exquisite Hawaiian Sprays instantly uplift your environment with their sensuous aromas and sparkling energy, opening the doorway to the unseen support that is always available to you. The essential oils for these sprays are hand mixed in small quantities from rare and exquisite essential oils from around the world. Spray lavishly around yourself, walk into the magical mists and feel your whole body smile! Please enjoy these offerings at our special introductory price. 1. Begin to create sacred space by centering yourself and making an offering of gratitude. Ask to be connected to the Deva of the space you are clearing. Call in the elements of Air, Earth, Fire, Water and love to enhance and add power to the process. State that your intention is to clear stagnant, non-serving energies from the environment and replace them with positive, uplifting, enlivening energies from nature. 2. To cleanse the environment you are working in, spray Clean Sweep™ around the room, paying extra attention to the corners and any areas that feel heavy or dense. Continue in each room you are Space Clearing. Spray Naked™ when you want to encourage self radiance, creativity, self expression, warm-hearted interactions, bring warmth and intimacy to a space and a bit of friskiness. Wonderful to use for social gatherings, dates, or for enhancing confidence for performances or presentations of any kind. Use Replenish™ to bring a very nourishing and peaceful energy into the space. Great for meditation and treatment rooms, yoga studios, nurseries, and in your bedroom. It will help neutralize stress and restore energy in a room as well as enhance restful sleep. Use Veil of Light™ to envelop your space in a cocoon of safety and protection, creating a sanctuary from sensory, electromagnetic and social stimulation. Before bed, spray yourself and your bedding with Veil of Light™ to disengage from the demands and stimulus of the day. Follow with Replenish™ to drop quickly into a deeply nourishing, restorative sleep. All of these sprays can be used in conjunction with traditional space clearing tools that utilize sound, such as bells, singing bowls and drums. 4. To complete the process, give thanks and ask to close the connection with the Deva of your space and the forces of Air, Earth, Fire Water and love. Notice the vibrancy and freshness of your environment and how good this feels! We recommend using these four sprays on a regular basis to maintain the clarity of your home and work environments. People in the healing professions will benefit from refreshing their treatment rooms between clients. When you travel, Space Clear your hotel room when you arrive and mist your rental car when you pick it up. 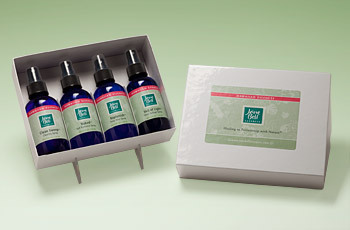 If you move into a new home or office, use these sprays to facilitate your new beginning. 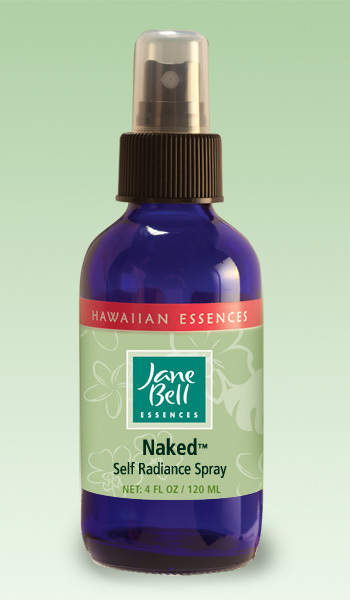 We hope you will enjoy using the Hawaiian Sprays as much as we did creating them, and we would love to hear about your experiences with them! 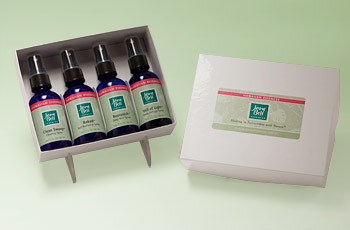 Our Hawaiian Sprays Gift Set contains one of each exquisite Hawaiian Spray arranged in a sturdy and attractive box. Clean Sweep™ clears and refreshes your energy field and environment. Spray liberally to brighten your mood, lift your spirits, and make room for future possibilities. The invigorating effects of the essential oils of Black Spruce, Lavender, Lime, Peppermint and Spearmint infuse this dynamic spray with vibrancy. Naked™ liberates your self radiance so you can express yourself and share your gifts with the world. Spray whenever you want to be seen and valued for who you truly are. It’s so easy to know who you are when you are being yourself! The exquisite essential oils of Bergamot Peel, Jasmine Grandiflorum, Jasmine Sambac, Sweet Orange, Tulsi Basil, Vanilla and Vetiver caress you with luscious beauty. Naked™ liberates your self-radiance so you can express yourself and share your gifts with the world. Spray whenever you want to be seen and valued for who you truly are. It’s so easy to know who you are when you are being yourself! The exquisite essential oils Bergamot Peel, Jasmine Grandiflorum, Jasmine Sambac, Sweet Orange, Tulsi Basil, Vanilla, and Vetiver, caress you with luscious beauty. Replenish™ calms and soothes your mind and body, bringing you into a state of deep relaxation. Use to regain balance during stressful times, to restore energy reserves, and before bed to enhance restful sleep. The rejuvenating essential oils of Lavender, Jasmine Grandiflorum, Red Mandarin and Tangerine Peel grace this spray with their gifts of renewal. Replenish™ calms and soothes your mind and body, bringing you into a state of deep relaxation. Use to regain balance during stressful times, to restore energy reserves, and before bed to enhance restful sleep. The rejuvenating essential oils of Lavender, Jasmine Grandiflorum, Red Mandarin, and Tangerine Peel grace this spray with their gifts of deep rest. Veil of Light™ envelops you in a cocoon of safety and protection, creating an inner refuge from sensory, electromagnetic, and social stimulation. Use to feel more comfortable when you are out in the world. The rare and exquisite essential oils of Bergamot, Green Mandarin, White Lavender and White Lotus wrap you in a gossamer veil of peace. Veil of Light™ envelops you in a cocoon of safety and protection, creating an inner refuge from sensory, electromagnetic, and social stimulation. Use to feel more comfortable when you are out in the world. The rare and exquisite essential oils of Bergamot, Green Mandarin, White Lavender, and White Lotus wrap you in a gossamer veil of peace.